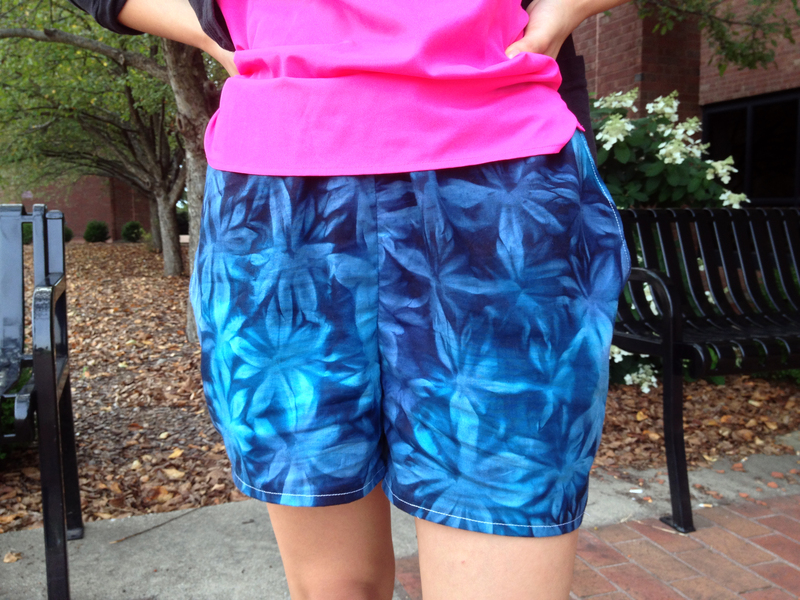 Here are my second pair of Jessica shorts! The first pair I made had to be taken in some, so I cut the same size and used french seams on this pair. And in case you hadn’t heard, I was a featured maker on Kollabora this week! After seeing my first pair of Jessica’s they contacted me about this, and I was super excited! You can see it HERE. This is the same fabric as the white skirt I made earlier this summer. The fabric is semi-sheer, so I hemmed the short by hand using a slipstich. I’m wearing white leggings under them here, but earlier this week I wore them with short black leggings that had a lace hem, which is cuter I think. I should have lined the shorts, but by the time I decided this was the better option, I really didn’t want to go back and unpick all those french seams. I think these will be fine with long leggings as the weather gets colder. 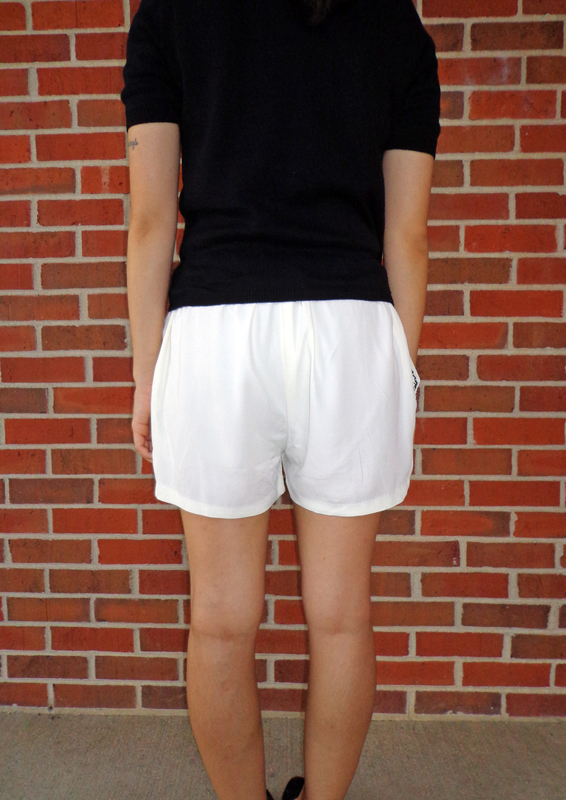 I decided to add some cute pocket details since the shorts are one solid color. I drew the scallops with a water soluble marker and ruler. I used backstitches and french knots. I have promised myself I will not start a new project until every one of those UFOs is complete. So here’s the first completed project! 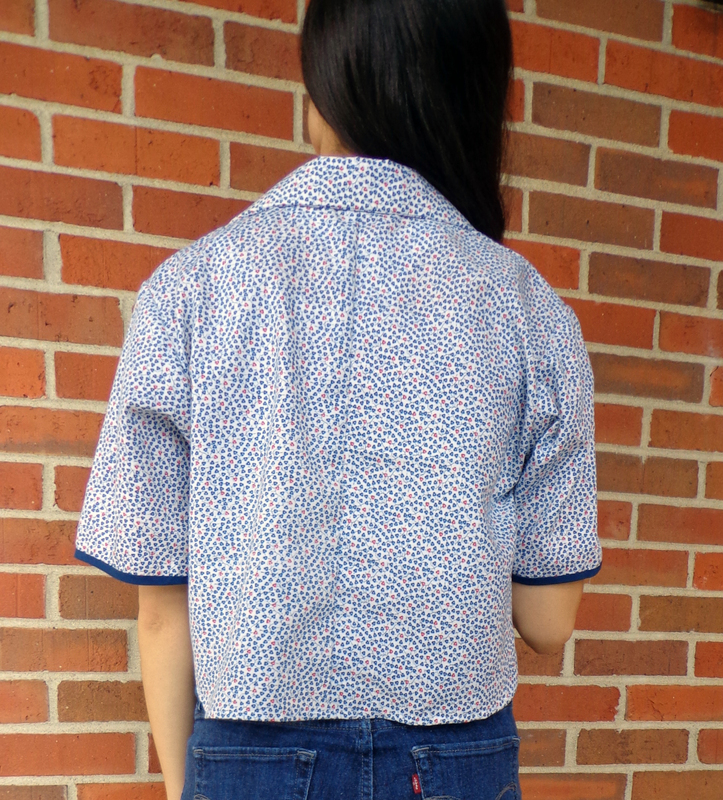 This shirt is McCall’s 4702. I picked it up for 10 cents at my favorite charity thrift shop when I was home this summer. It was printed in 1990. It’s boxy and cropped, which is the style steer towards too much. But I’m not crazy about the shirt. I didn’t realize until I got to the part of the instructions that said to sew in shoulder pads that this pattern called for shoulder pads. I guess I just thought the models on the cover had really straight and tall shoulders? Haha- oh well! I obviously left the pads out of mine, so the shoulder seams sit slightly off of my shoulders. The sleeves are just SO big. I haven’t decided whether I absolutely hate it yet or not. What do you think? The back of the shirt also features a “design feature” (aka mistake). The back piece was cut on the fold, but I didn’t look closely before I cut. There was a chunk missing out of the fabric that I didn’t notice. I had one fabric scrap that was just barely big enough to cut out half of the back piece. Hello unwanted center seam! This was my first time sewing a collar, and I really liked it! The instructions were a bit confusing, but I figured it out and it totally makes sense now. I want to start making more professional/fitted types of garments. I have yet to find a good looking trouser pattern, but I recently heard about this cool new line of indie patterns called Named. I’ve got my eye on the Tyler shirt. I’m kind of covering it up with my arm, but there’s a cool curved side split on each side of the shirt. In other news, today was the first day of school. I actually only had one class, environmental economics, but then I also went to work. Here are some of my textbooks this semester. I still need to get my intro to managerial accounting textbook and statistics textbook as well as online access codes for 3 classes. So don’t expect me to keep up my current rate of sewing once school really gets underway! And don’t forget to check out my Etsy store–> the link is in the sidebar to the right. I’ve got a few more finished pieces that will be added soon as well as some more UFOs, so stay posted! I’ve been patiently waiting for a sew along or sewing competition to participate in, and Kollabora is hosting a little competition with Schnittchen Patterns! 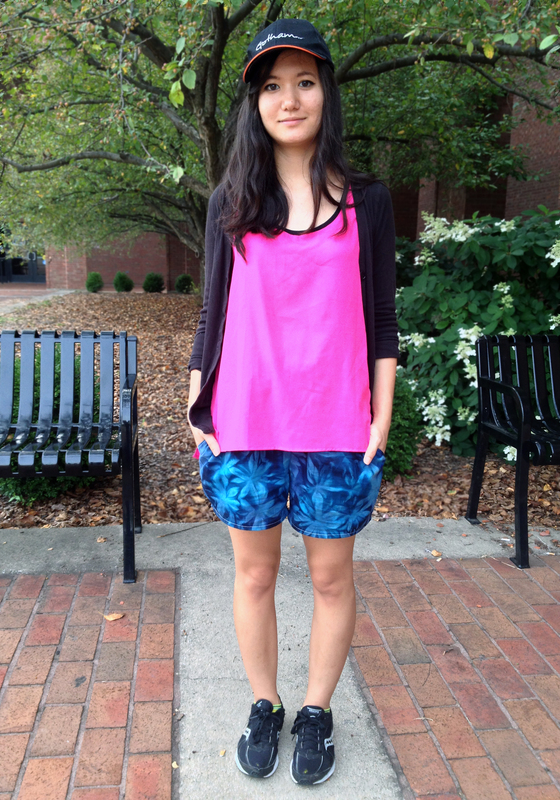 Kollabora users can choose to sew either the Jessica Shorts or Katja shirt. 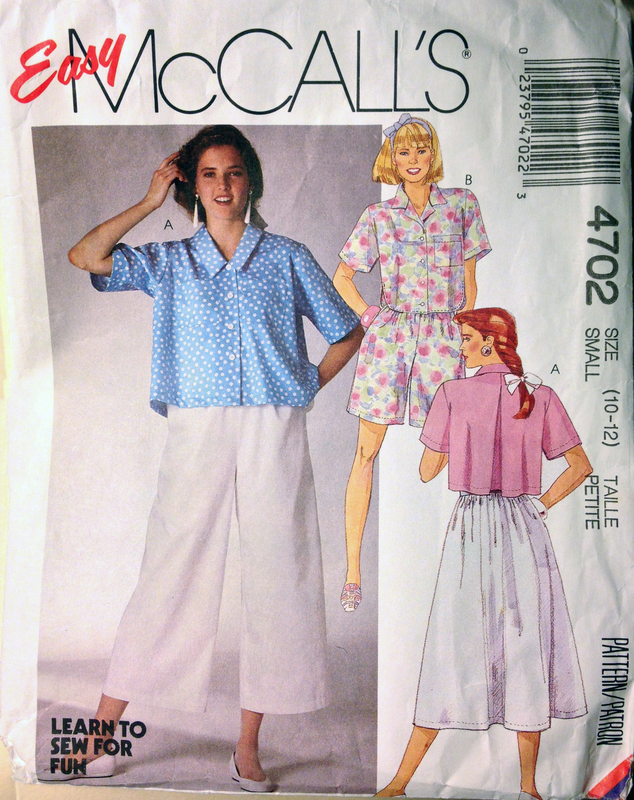 I’ve been wanting to make some longer, casual shorts so I chose the Jessica pattern. This is also my first time sewing pockets! The pattern is only $5 for a digital download on Schnitten’s Etsy page. First of all, these were really big. I ended up taking in all the seams in by 1 cm more than was called for. The size plus the blue flower print made me feel like I was wearing men’s swimming trunks Still not sure how much wear I will get out of these, but I think they look better in context with the hot pink shirt and baseball cap. They aren’t the most slimming shorts. Here’s how they’re supposed to look. The instructions are a bit confusing because they’re translated from German, but the photo tutorial (in German) online was helpful and this is an easy pattern. I also recommend having enough ink in your printer that you can read the directions and symbols when you print your pdf pattern 😛 I really want to try the Lisa pants. They also have more patterns on their website here, so hopefully those will be available in English soon! I have two new shirts completed! I couldn’t think of an alliteration for this knit top, but it’s still awesome. 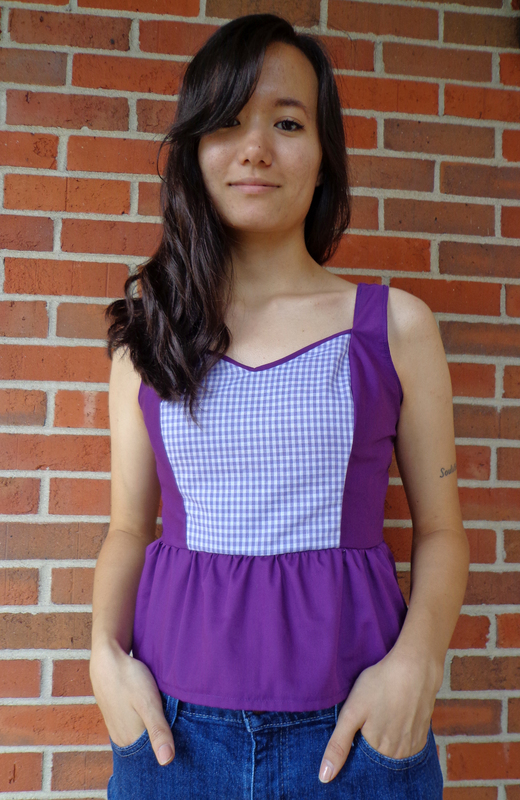 I had just enough leftover fabric from the skirt I made a while ago to make a matching top! I just love coordinates– just look at my Pinterest page haha. But this shirt also works well with the dreamy white skirt. This shirt is so comfy and the white skirt fabric also feels great against skin. Who says fashion shouldn’t be comfortable? I left the edges raw on purpose because I thought it looked cool. I still think so, but when paired with this skirt, I think it would look neater with a binding. I might go back and do that if I can scrounge up enough scrap fabric. I’m looking forward to making many more variations of this top. I’ve already got another one in the works. All I am going to say is…COLOR BLOCKING! It’s gonna be sweet. I actually started this one before I started the dress version. Since I didn’t have instructions to follow, I ran into some time consuming technical difficulties (mostly regarding lining methods). I’ve been wanting to make something with gingham for a while now. This gingham is from Grandma’s stash of fabric she let me go through. There wasn’t much of either of these fabrics, so this project made really good use of them. The shirt is more of a crop top. I would have made the peplum longer but I ran out of fabric. Since I’m not the belly baring type, I need to make a skirt or something high waist to wear with this. I’m really wanting to venture into the land of sewing pants and make some black trousers. To make the straps stay in place and be comfortable, I used elastic casing for the top back part. It’s a little bulky, but it works. The next thing I want to to with this pattern is to add sleeves and raise the back. I actually hate wearing sleeveless tops- I usually only wear them at home or with a cardigan. I’m also wanting to experiment with flutter sleeves. Today I wanted to share a short story on how and why I decided to start this store. I discovered Etsy my sophomore year of high school and was completely blown away. I had never seen anything like it before, and was amazed at the range of unique products and skills I saw. At this point I knew how to crochet but was only starting to experiment with making round objects like hats. I didn’t know of many people who enjoyed making things like I did, and I hoped that maybe I would have the skill and guts to open my own Etsy store one day. Since then I have learned to knit and also enjoyed graphic design, which I dabbled in while running the high school newspaper. 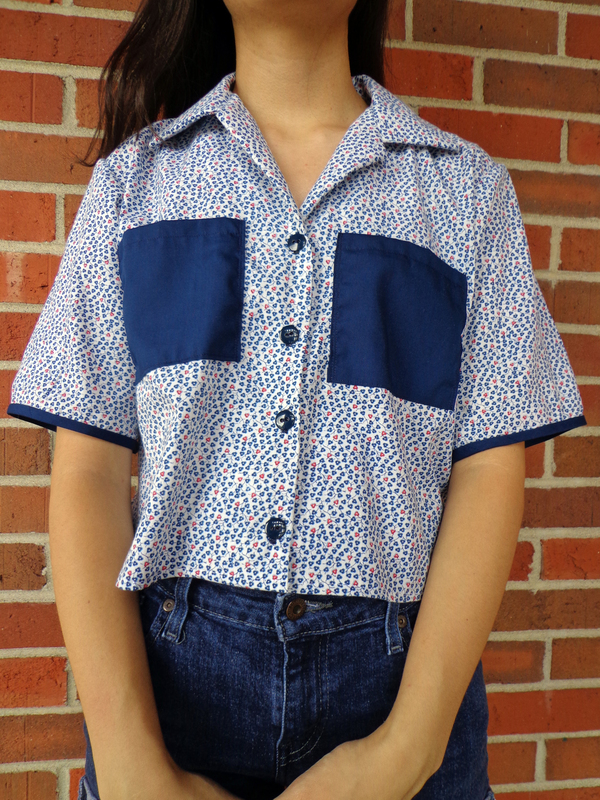 It wasn’t until last winter that I joined the world of sewing, but I was immediately in love. Sewing is such a great skill to have. Even if you don’t make your own clothes, you can better appreciate and understand what goes into making the Ready To Wear clothes you buy at the store. Sewing gives you an alternative to mass manufactured uniforms and opens up infinite creative possibilities. Making my own clothes has given me more confidence in the way I dress, and I don’t have to worry if my clothes were made by some underpaid worker in another country. I have more of a personal connection and appreciation for my possessions. I want to share some of these things through Sister Cities. Natasha and I decided this year that we were going to take the leap — we felt like if we didn’t try it now, then we would end up putting it off forever. So we swallowed our self-doubts and got to work. Everyone has to get started somehow. I always enjoy hearing stories of successful business owners and artists who had humble beginnings by walking around door-to-door with their designs or by selling scrunchies they made to their school friends. If they did it, then we can too! We want Sister Cities to be a place where you can shop for yourself or for gifts to others. There will be women’s clothing, totes and small bags, and crochet toys/collectibles as well as anything else we dream up! Right now there are only a few things for sale, but many new items will continue to be added in the next few weeks. And we would love to hear feedback on the items you like the best and want to see more of– so stop by the shop and have a look and like our new Facebook page here. A few weeks ago, I was up late at night sitting in front of the sewing machine thinking, “What can I make next?” I couldn’t stop thinking about these two pictures that I had pinned on Pinterest. I don’t know the source of the first picture, but the second is from Peter Som’s Spring 2012 collection. Here’s what I came up with! 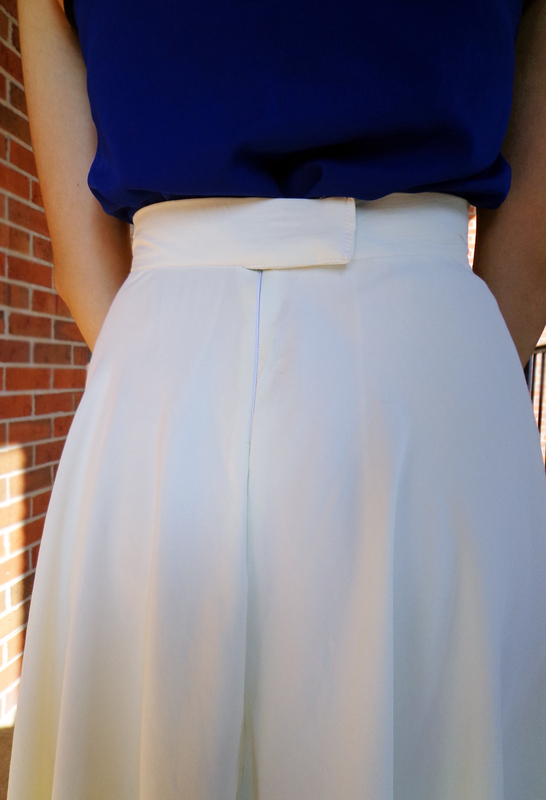 This creamy white, drape-y, gorgeous skirt! Don’t you wish everything in your closet made you want to do that?! Anyway, let’s talk about the construction. There are four triangular panels, the waist is interfaced, and it closes in the back with an invisible zipper and a hand sewn hook & bar. As a result, you can see that the seams are a little wonky. Btw, those are all french seams. Ooh-la-la! Despite a few mistakes, I am absolutely in love with this skirt. It’s a bit fancy for everyday but I think I will wear it anyway because fashion is about what makes you happy and confident, not what people in central and eastern Kentucky think about what you wear! Hi and welcome to my blog! This is where I share some of the things I make along with things I find inspiring or cool.